Do you need a reliable VPN tool to protect your privacy or unblock restricted contents? Don’t know which VPN provides what you need? You come to the right website. Our experts have tested all the popular VPNs to sort out the trustable and powerful VPNs. At this Internet age, users’ privacy is not guaranteed and can be accessed easily. A VPN is needed to keep your personal information private. TunnelBear is one of the recommended VPNs. It is a useful tool to protect privacy, safeguard communication and bypass geo-restriction. Learn why it is recommended in this TunnelBear review. TunnelBear uses advanced and efficient encryption standard to secure your connections and improve your privacy sufficiently. It supports OpenVPN with the ultimate AES 256-bit encryption and SHA256 authentication on Windows, Android, and Mac devices. OpenVPN is a fast and new VPN protocol. It should be your first choice if it is compatible with your device. IPSec/IKEv2 with AES 256-bit encryption & SHA256 authentication and IPSec protocol with AES 128-bit encryption & SHA1 authentication are optional encryption methods. You can choose needed protocol to suit your network. It is the industry encryption standard. Currently, there is no breakdown of technicalities to crack this standard. When your network is secured by this VPN, you can log in your email & favorite website, shop online and share private data with your friends securely even when you are on a trip. There is no need to worry about information leak or cyberattack. Besides, TunnelBear has a tool which alerts you when you are about to connect to an insecure WiFi network. You should note that hackers create and make use of phishing WiFi hotspot to attract users into connecting. When you log in your bank account or use precious information via the phishing network, hackers can steal the information and grab your money. Therefore, it is very important to install TunnelBear to safeguard your communication data. 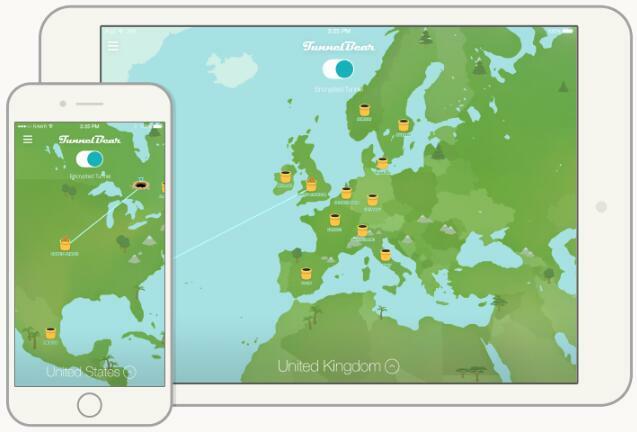 TunnelBear enables you to access the Internet without limit with an ever expanding network. It has servers spread across twenty countries around the world. You can connect to servers in Australia, Brazil, Canada, Denmark, France, the United Kingdom, the United States of America, Germany, Hong Kong, Singapore, Spain, Sweden, Switzerland, India, Ireland, Italy, Japan, Mexico, The Netherlands and Norway. The worldwide servers make it easy to get around blocked sites and censorship. This VPN tunnels your request to server in another country with a less restricted Internet. If WhatsApp is blocked in your country, you can connect to server in the US or another county which supports WhatsApp to unblock it. Your traffic travels through encrypted and remote server. That prevents your ISP from throttling your connection and sidesteps network gridlock. We suggest you connect to a nearby country so as to gain decent speeds for enjoying buffer-free streaming. We had impressive speed during the VPN test and could load HD videos at pretty fast speed. To maintain high speed, TunnelBear offers Closest Tunnel Auto-Selection feature to help you connect to closest server and best tunnel automatically. This feature guarantees great speeds and lets you browse the websites without geo-restriction concerns. You know what? Your IP address can be used to figure out your physical location and track you across different websites. When you browse the website, your IP address is shown to others and it acts like your online ID. The advertisers, social media and other parties use different methods to track you and collect your personal information. As you rely on your ISP to use the Internet, your ISP knows everything you do online. What’s worse, your ISP can sell your browsing histories to the third party, and it’s not an illegal action. To prevent others abusing your privacy, you should ask TunnelBear for help. This VPN connects you to remote server and switches your IP address to a different country of your choice. 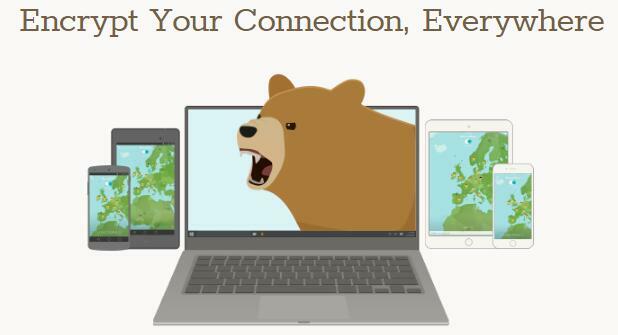 One of the major reasons users purchase TunnelBear VPN is they try to bypass location-based restriction and access the network freely. Some of you may notice that many streaming services come with geographic restriction. Famous streaming services like Netflix and BBC iPlayer have the strictest controls on international access on the earth because they have to abide by the contract stipulations from related companies that grant them the right to show content in certain countries. To follow the contract, Netflix checks where the request comes from and invest money in blocking VPN access. Currently, few VPNs get through the Netflix proxy detection system. The company locks out access over the Internet from users located outside their country. Besides, countries with high-censorship block VPN too. The government blocks some famous social media platforms. After they found their people use VPN to bypass the censorship, they started to block VPN. This situation happens in China. This country has great firewall to block Google, YouTube and Facebook etc. as well as crack down VPNs. The VPN blocking makes it difficult for travelers to access their favorite websites. Luckily, TunnelBear makes use of obfuscation technology to disguise your VPN connection. GhostBear is a leading feature which is able to make encrypted data less detectable to governments, firewall, web server and ISPs. The streaming services won’t recognize that you are using a VPN. You will still be able to stream tons of blockbuster hit movies, TV series, shows, documentaries and more wonderful contents on Netflix when you are abroad. TunnelBear makes it easy to circumvent the complicated firewall, providing Chinese users an unrestricted access to all censored websites and applications. Please note that TunnelBear does not allow you to enable GhostBear when your PC is running custom proxy. If you fail to unblock restricted content, you can check the custom proxy. VigilantBear is a VPN kill switch which prevents data from being leaked outside of the encrypted VPN tunnel. It is an extra layer on private information protection. If the VPN connection gets disrupted for any reason, it blocks all your connections to the Internet to stop your real IP address from being exposed and keep your data private in the few seconds when TunnelBear is connecting and reconnecting. The ISP can’t view your connection even when you are not protected by VPN. The hackers can’t seize the chance to intercept your session to steal confidential information. If you lose your default network, TunnelBear will not allow your device to connect to malicious network. It keeps your device safe and avoid malicious attacks. Besides, TunnelBear has SplitBear tool which allows you to select which app will be exempt from VPN connection. That makes your normal connections faster because they won’t be rerouted through remote servers. You can access both local and foreign websites smoothly without conflict. TunnelBear provides clients for Windows, Mac, iOS, and Android. This VPN also works with Linux while it requires some manual configuration. The provider offers extensions for Opera, Firefox and Chrome. What’s the difference between using the app or browser extension? VPN app will channel all of the Internet traffics from your device to the remote server while extension only handles communication data over the browser. The provider allows up to five simultaneous connections with one single account. Multiple devices will be protected. The VPN client is intuitive & straightforward and can be navigated conveniently. It is simple to install and set up VPN that can be done within one to two minutes. You won’t need to go through any complex menus or configurations. It’s easy to find useful features that are located behind the cog icon along the left-hand side of the app. They are well-organized. You can toggle on and off needed feature with one click. The client allows you to view your connection in a vivid map. 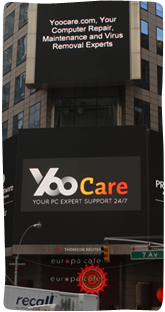 It you need any help in using the VPN service, feel free to contact the provider. TunnelBear provides customers practical knowledge base with commonly asked questions and dedicated support staff. In knowledge base, it categorizes information in Status Updates”, “Getting Started”, “Accounts & Payments”, “Browser Extension Help”, “Windows App Help”, “Mac OS X App Help”, “iOS App Help”, and “Android App Help”. In this way, you can find solution to your issue easier. If you need direct solution, send an email to the provider to explain your issue. It takes some hours to get a respond. It would be great if TunnelBear provide live chat so that users can talk to live person directly when they have problem. Problem will be fixed more effectively. How to get started with TunnelBear? It is very easy. Simply select a plan you need and choose a payment method to sign up. After you finish the payment, it will redirect you to download VPN client automatically. Click the Download TunnelBear button on its website. Next, click on the installation package to launch the installer. The wizard will take you through every step of the installation. You need to enter your username and password to log in your account, and the VPN is ready to use. When we tested the VPN, the VPN connection was established quickly every time we launched it. You will see an animation of the tunnel and a bear popping out of the end of the pipe when connection is established. After that, TunnelBear will safeguard your data and obscure your web browsing. 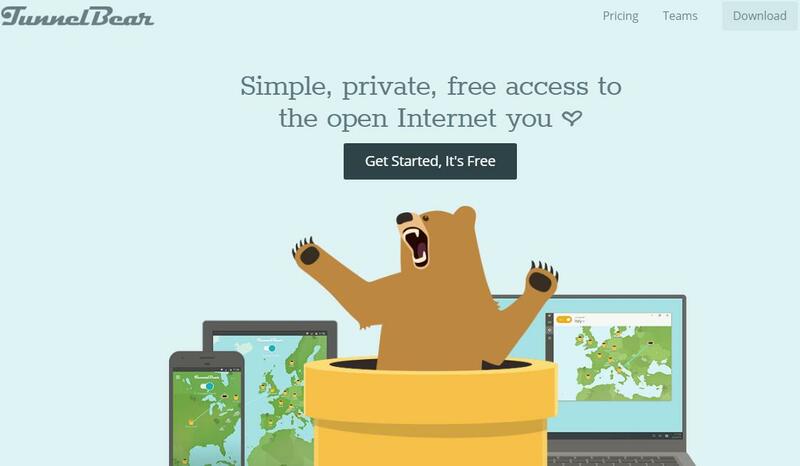 TunnelBear offers free and premium version of VPN packages. There are Little, Giant, and Grizzly packages. The provider kindly offers Little package which is the free version of TunnelBear. It allows you to test the VPN without spending a cent. This package comes with 500MB of free data every month. If you always use VPN to stream videos or unblock restricted contents, you need the premium version. Giant and Grizzly plans allow unlimited data. Grizzly plan works out cheaper when calculated on a monthly basis. Giant is a monthly plan. It costs $9.99 USD per month. At this time, Grizzly is 50% off. It provides you access to all the features included in the Giant plan while it includes big discount. It is $59.99 USD for 12 months and costs $5.00 USD per month. The competitive price attracts many users. The provider accepts a wide range of payment methods. You can sign up a plan by using VISA, Master Card, American Express, Bitcoin and Jars of Honey etc. Bitcoin is suggested because it lets you make payment anonymously. Others can’t track you according to your payment detail. Besides, the provider does not store any information related to your identity. Your privacy is guaranteed by the provider.